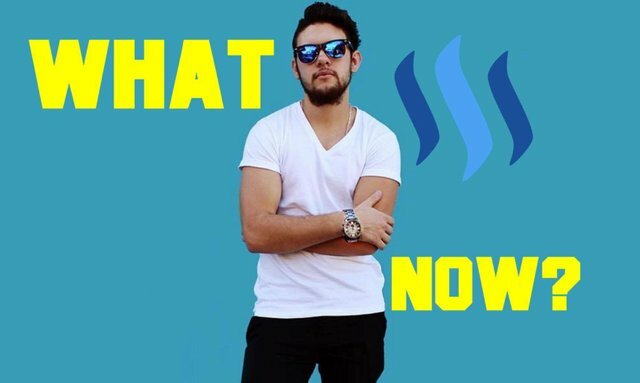 ⏺Steemit price crashing, what now?steemCreated with Sketch. I have one very simple answer to this, and yes I know most people who read this have short attention spans. So for all of you who are in a hurry, my simple answer is at the bottom for you! But for those who want some more details, I think it would be best if I build up to that answer with a little more explanation. It all starts with mindset. Whatever I say now, I am talking more specifically/personalized towards Steemit. The fact is, there are many people coming onto this platform lately with a very short-term, 'quick-buck' attitude. That might work if you are using your account like a casino, hoping that some of your posts will get a huge upvote or two.. But this is not going to set you up for success. Why am I discussing this first? Because it's the biggest reason for people being desperate on this platform. It's the biggest reason for spam. It's the biggest reason for so many people quitting when price decides to short. As funny as it sounds, you need to stop thinking about the money. And hey, I am not your parent, you don't have to listen to me, but numbers do not lie either. The odds are, if you do solely focus on the money, there is a good chance you will get eaten alive in your initial stages. Nothing truly successful happens overnight. I know, some people are overnight victors, but so are Lotto players. You need to create a long-term vision for your account. The ironic thing is, when you are focusing on how much you're making, you are never satisfied, and you tend to generally not do that well.. But when you focus other things like making the best content, and building real friendships, a lot of the time you will start doing much better financially. I joined Steemit 19 days ago. I am in no means saying that I know everything, but I have spoken to a few of the most successful people so far on Steemit, and they all are telling the same story. Most of the big accounts that you see today, did not happen from a quick deposit. The 1% of Steemit 'heavy-hitters' have been here for more than a year already. They stuck things through when price was at $4, as well as when price dragged itself all the way to below 10 cents. That's how many of them made majority of their Steem Power. So, what is my opinion of Steem prices dropping? I am a little disheartened.. Note that I said "a little". I am disheartened because of the fact that so many people are losing faith. However, I am FAR more excited! See I want price to drop to 10 cents again for various reasons. So that I can test my ability to be patient, and to grow this community for what it is here for. So that I can invest external money into the account for when it starts to rise again. By having all the space wasters (no offense) leaving, the rewards pool would become stronger for each individual. It's like sharing a packet of sweets with 100 ungrateful people, versus 10 appreciative people. To filter out all those people who are here just for a 'quick buck'. The joining rate is increasing every single month, and majority of people, when it comes to anything in life, will have the wrong mindset. By price falling to that price, most of those spammy people would have lost all motivation, and simply given up. You need to stick with things through the good times as well as the more stressful times. For people who can learn to do this, are rewarded accordingly! Guys, let me know your thoughts in a comment. I love to interact with you all! Remember that I upvote resteemers, and quality comments. My main Instagram account is currently at 36K+ Followers. Nice post. I like your attitude. I'm in it for the long haul and not here for the quick buck. I see big potential in Steem. The price is down in crypto across the board not just Steem. Once BTC gets things straightened out, Alts will rise again. The long term holders should benefit. I'm not selling. I'm a strong beiever in the crypto potential. Good luck! I'm glad you liked it! I appreciate that. Yeah, all the crypto's are taking some strain right now.. I'm interested to see what the future holds for us! Thanks for stopping by! Talk soon. haha yeah - buy the dip!! Thanks for stopping by @BTCMillionaire. I gave you a follow. Keen to hear your journey! Ey :D We are making progress! I knew the time would eventually come when you left a comment on my content :D Finally LOL! This was a very uplifting post about what is happening with the huge influx of new Steemit members, spamming and low price of Steem. I enjoyed your display tray image. I think I would most definitely try to buy some decent amount of steem power if the price keeps dropping and hope that these rough times will result in cleaning out the platform of people here with a short term vision. Awesome comment! I am glad you liked that image :) Yeah this site is going to shoot up one of these days, so better get in at the right time! I actually just made my latest post about 2 minutes ago. Let me know your thoughts there :) It's a bit of a shorter post. Talk soon! Personally I don't even know why people would stop using steemit when the price is down. That doesn't affect anything. You still get the same steem profits if I'm not mistaken. I totally agree that people always act on a whim. Those who stick to the platform, or most of time to anything, are those who prosper. The reason I'm worried about not getting votes at this time, is that I believe now is the time when one needs to put work in, because the great times are coming. Those who will gain now, will have an upper hand in the future. But the sad truth seems to be that I get less and less upvotes all the time. Luckily I found minnow support at least so I can still keep growing my reputation, because that is what I am currently interested about. I don't mind putting work into it, but at the same time it is disheartening to see people post "a funny picture" copypasted from the internet, earning more than I do with my own quality reasoning on investments and financial stuff. Anyway, I'm trying to find new people to interact with, who have similar interests here. That is the point of steemit anyway. But I can't lie, the profits are a big plus when it comes to steemit and hope to some day be able to make something for the time I invest into the community. All those factors link into one another. By having a good reputation, you are more respected. People take you more seriously, they take your content more seriously. Upvotes start to rise and so does pay. If you want to see results, you need to take MASSIVE action. Like Grant Cardone would say, you need to 10X your actions. Massive action means massive results. Instead of hoping and praying for more upvotes (which will be pretty much useless to be blunt about it), go and get your name out there. I will challenge you. If you are up for it. Go and make 100+ comments per day for the next 7 days. Take record of all your current factors. How many upvotes you get on average.. Your amount of followers.. Your retention rate.. etc. Sure, 100+ comments per day could do that, but it could also be seen as spam. Unless I would really concentrate on what I'm writing each time. But it's not only that I can't write that many, it is also that I don't find so many posts that I enjoy reading. I try to keep up with as much of the investment posts I find, which are quality and unique to some extent at least. However, I just don't find them always. Part of it is probably the way steem works but much of it is the plague of what I consider spam or unquality posts. I enjoy reading quality posts such as those you write, but finding people with constant quality or constantly interesting topics is hard. Therefore, I only follow a bit over 30 people so far. And I've been dropping some people out who I followed in the beginning, but who didn't really live up to my expectations or started spamming my feed in a way or another. Anyway, maybe I should try something like: comment 20 times per day at least. But then again, usually when I comment I want to also upvote the persons post and I can only sustain 10 votes a day. I've been trying to do that more or less. During the weekends I'm more busy usually so I don't have as much time. They don't have to be spam. Spammy comments can be seen from a mile away. I know a hand full of people (including myself) who do 100+ per day, and they are genuine comments. The point is to engage with as many different people as possible, to get as much exposure possible in the beginning. I make an assertive effort to not be spammy. As a matter of fact, I strive to always right the most quality comment that I can. But I get what you are saying. You are really focusing quite a lot on quality! Which is awesome. I try not to link my upvoting with my commenting. I only upvote on the posts that I think deserve it (even though it's only 10 cents LOL!). The rest of them, I see it as me doing my part. Sure, I also don't reward people with bad post or wrong information even if I comment that they didn't consider this or that. Or sometimes the post isn't bad, but it just doesn't have the correct information, in which case I might comment something hopefully constructive, but I don't upvote it. Also sometimes if something already has +$100, I might comment, but not up vote because no one cares about my +$0.01 at that point, but most of the time I still do up vote. Anyway, I'd rather up vote people's posts that don't have a lot of up votes or at least not 100 worth. So yeah, most of the time when I take my time to comment on something I already consider it a good post and therefore up vote it also. Sometimes that isn't the case. Fantastic post! (Again ;) I couldn't have said it better. I came on the platform when it was worth about twenty cents, and built my sp to over twelve thousand just by doing...well everything you're doing, haha! What a lady-beast! That's what I'm talking about.. 12K+ Steem Power just from working the system. And it's only going to compound from here. Yeah, I do agree. Bringing external money in will do dramatic effects if you are adding it to your current earnings! Yes, as harsh as it may sound, the current price drop will filter out the "space wasters" as you call it. My take on Steemit is that it is a good opportunity to get in early and build QUALITY NICHE-RELATED CONTENT to attract people from the same niche. Currently more than half the posts are about one niche: crypto currencies, which is understandable, but for the platform to grow, we need quality content creators from different niches. Content creators will be turned off when they see obvious spam posts getting rewarded. If the price does go down to 10 cents, by the time it gets there, all these space-wasters will have left the platform and this would be better for the future of Steemit. I've mentioned this repeatedly that I will keep accumulating. If I have $500/month to invest, I get 1000 Steems when it's at $0.50 and I get 5000 when it's at $0.10. Since I believe in the Steemit platform and I have a long term mindset, I know this will pay off in the long run. Very well said. I like how you are thinking. We do need to have each niche balanced out. To have influencers in each niche, we will really diversify the platform! And as far as I know, there isn't a limit to the amount of categories we can have.. I cover the concept of Dollar Cost Averaging in a few of my previous posts. It's such a powerful technique, especially in our case. The future as of right now is looking so strong! It's really exciting! Thanks for your comment. I appreciate you taking your time out to write it. I trust we will talk again soon! The thing that keeps me happy in Steemit, especially in a volatile market, is that I never have ANY expectations of earnings. Never have. Never will. My first few MONTHS of Steemit barely broke a dollar combined. But I didn't lose faith because I wasn't here for the money. Sure, the money is nice but I wanted a place that wasn't going to shut down and lose all my content! So here we are through thick and thin...happily posting because I don't use my wallet as a barometer. That is just brilliant! And of course! Due to it being on the block chain, after 7 days the content is set for life! Pure genius! It's by far the most powerful way to create an incredible portfolio. The thing is, sure you can make some decent money here from the set go.. But even if you don't, like in your case, people will be able to scroll back in your blog. If you stuff is quality, and you have been consistently putting in the work, you are bound for things to become better. Simply because not many other people are doing it, so you automatically become the 1% of difference-makers! I am Steeming Not for money :) but to Discover New Stuff. That's the best way to do things hey! Trying to constantly discover new things will always keep your on your feet, moving forward! Awesome stuff. Talk again sometime. Thanks for this awesome comment @Cryptodata! You pretty much summarized the majority of my article in one comment LOL! Thanks for stopping by my man! Talk again soon. Good to see you have the right mentality. It's like we were kinda writing the same post at the same time today! "Don't do it for the money"
So - nailed - it! Good job! Earned my follow and upgoat! I have followed you back. Talk soon. "Price of Steem is down"
Which for me is an invitation to examine whether the underlying fundamentals of this-- or any-- investment has changed to warrant less confidence. If the underlying reason for investing is intact... then the price swing must be all psychological and not fundamental... in which case, we're in the middle of a great "50% off sale!" I happen to think Steemit is a unique social content platform for the long run... the the current "dump and run" is a mix of natural profit taking and too many newbie investors freaking out over natural fluctuations not worth freaking out over. I could not have said that better than you just did. Seriously, well put. It's true. Many people just don't understand even one bit of the fundamentals of investing in general. If I see the price of Steem falling, and start to question why people are making so much less on their posts, I check one thing.. I look at their previous posts, and see how many upvotes they used to get a week ago, and I compare it to how many they are getting in the drop. If they are making a lot less per post, but the amount of votes are still around the same, if not better, then it is clear that the currency is just in temporary draw-back stages, and as you stated, is at 50% sale LOL! Thanks again. I appreciate you stopping by :) Talk soon! As a newb myself, I'm really not looking to make much for a year or more. Plus also not looking to cashout for a few years at least. Just keep grinding out content and reinvest it back into Steem Power. 100%! If you are not looking to make decent money for an entire year then you have set your expectations brilliantly! That's almost a fail-proof system if you stick with things. Good to see you again my man! Talk soon! It dropped as low as $.07 and I wrote twice a day because I knew I was getting paid in Steem not USD. When the price rebounded, well I did very well. As hectic as 7 cents sounds, I really wish I was there with you! I'm sure you learnt a lot from that experience? You are one of those examples that I mentioned in the article who stuck things through, and that's why they are who they are today. Beast mode! Thanks for stopping by man. Talk soon. For those that join only to bail because they aren't happy with their results i say go back to facebook and enjoy it the same way you did before giving up on something really good here. 100% LOL! If you minus all factors, this is still so much better than anything else out there. Hilarious haha! Thanks for your comment. Stay in tune :) Talk soon. I agree with your philosophy. In fact i joined steemit with same mindset to earn some quick bucks and lost faith in it after a week or so. But now I am back with more commitment to myself to do whatever it takes to be successful on this platform. Sure I may lose hope again in a few days but that's the challenge I have to face as you can only get successful at something if only you stay committed with yourself. Thank you for sharing your thoughts with us. I was exactly the same in my first 48 hours. I was solely chasing money, wanting to make $100+ on each post, etc. Thing is, if you are afraid that you might lose faith again, then the question is, why? Why do you think you might lose faith again? Make a goal for yourself to make one new friend per day, and work on that! Then at the end of the next 7 days when you have 7 new awesome friends, let's see how you feel then. Besides, even if you only make 1 or 2 in that period, you will still have gained something..
That's what I'm talking about! Yes! Don't take any excuses. Just push through and never give up. See you at the top! Talk soon. There isn't a whole lot one can do from a day by day standpoint other than set yourself up for the long haul. Knowing that what's your end game? You have to know what you want and that will pay off when your setting it all up for yourself. We have to realize that this is just the beginning and it's still in Beta and most people haven't even heard about it and if they have they haven't seen the benifits of it yet. So keep doing what your doing and when everything smooths out people will be rushing in and then you will see how it all benefits you. People amaze me anyhow! They'll post all day on Facebook or Twitter for nothing and piss and moan when they actually get something for their creativity and they don't think it's enough. Crazy world we live in, but it's comical to sit back and watch it. It's true, in terms of trying to make a home-run in one day, it simply can't be done.. But in terms of day by day actions, that is what needs to be done to be able to achieve the end result. Yeah it's so ironic, I know. People in general just do some things only because others do.. Like if their friends post on Facebook, so will they lol.. It's understandable, but they don't think further than their own feet. Thanks for your comment. Talk soon. And the South African connection grows. Followed for more brilliant insight. Resteemed to help my own followers. It reminds me of sporting teams. When the team is doing well the supporters seem to come from nowhere. In the tough times, it is only a handful of dedicated supporters showing up rain, hail, or shine. It is these supporters that feel the biggest rush and receive the biggest emotional gain from supporting their team through the tough times. People are sheep. If we can show that supporting each other works..... The rest will soon follow. Hang in there legends. Very well said! As sad as it is.. There is only about 1 shepherd for every 100 sheep. Meaning that 99% of people have accepted the fact that they shall not lead, but be led. It just takes a hand-full of shepherds to do the right thing, and all the sheep with follow along! I see the prospect of further development of steemit in the future. I see no reason to leave steemit as it replaces other social networks. In vkontakte I have 10 thousand friends and almost 37 thousand subscribers on my personal page. I'm used to being here. And I understand that first you work for a reputation and only then the reputation works for you. There is definitely a strong future here. It's very clear to see. You nailed it on the spot in your 2nd point.. And reputation here is everything! It's clear from the superstars of this platform that hard, consistent work will pay off 10x here! Thanks for your comment @Maxer27! Appreciate you stopping by. Talk soon. You made some great points. I'm new here and really appreciated this post. This just makes me want to be a part of this community even more. That really puts a smile on my face! I appreciate your kind words. This is an incredible community. Honestly, it would be tough to find one similar to this! I am so very grateful that I found out about Steemit. Long term thinking vs short term thinking is what will separate/decide people's outcomes on this platform. Thanks for the comment! Appreciate it :) Talk soon. I like your attitude. You seems to be a great person. Thank you for this positive mentality. Only my pleasure! Thanks for stopping by, and thanks for leaving your comment :) Stay tuned! Talk soon. HAHA keeping it simple is always the easiest way to be productive hey! Yes, just stack up that Steem! Thanks for your comment my dude! Talk soon. ..excellent post!..intelligent, highmotivating words, like that..i m sure we re on the right way to future..follow you.. Thanks a lot for that! Appreciate your kind words :) Talk soon. Prices rise and fall like the tides but if you buy into the idea like I do then the spot price shouldn't matter all that much over such a small amount of time. If you are here for the long haul as you say (and which I fully support) and want to buy more SP if the price drops further, why are you powering down? Or have I missed something? Brother, that's a whole other thing.. If you have a lot of power when the price is dropping, I would say it'd be most effective to squeeze out as much value as possible from your power amount. Each week you will get 1/13th of your power level until the power-down is complete. When price is dropping, you should have your capital in SBD. When price is rising, it should be in Steem and Steem power. That's just something I thought I would play around with.It's just an 'in case' for if price ever really gets over-sold or over-bought, then you have some liquidity to play around with. It is necessary to strive for success! Thanks for your comment :) Stay in touch! Yes! That's the spirit. I don't doubt that for even a second! I think things are going to be incredible for those who stick at it. Thanks for your comment. Stay in touch. This post received a 1.8% upvote from @randowhale thanks to @enazwahsdarb! For more information, click here! Yeah man, good attitude. Luckily this platform is perfect for being able to give back, and to help others.